May 8th School Board Election just around the corner. Well the school board election is Tuesday May8th in Milford, and I hope everyone who lives in the district will come out and vote. One statement I find truth in is you can’t complain about election results if you don’t go out and vote. Now I have been asked by many,” why don’t you have all kinds of signs and ads out there in the district?” Well short answer is that I don’t have the MEA/DSEA money tree supporting me. The real reason is last weekend my wife and I along with another couple volunteered to drive the High School Marching Band trailer with the uniforms and instruments to Florida. Between the two couples we each spent ~$600.00 in fuel and hotel fees to watch the band march down Main Street USA in Magic Kingdom. So I invested in my son and his fellow band mates to see their faces as 30,000 visitors to Disney cheered them on as they marched and played for them. Whatever the results of the election, I will accept them and do my best wherever I land. I just want to thank all those friends who have supported me during my time on the board and during this election. Milford Beacon cuts and pastes my interview why? Well seems the Milford Beacon decided that I was either too wordy, or they just did not want folks to see what transparency looks like. Either way I’m re-posting my answers to their questions in there entirety so the folks in Milford can make the right decisions on May 8th. Why are you running for School Board? I am running for the board because I still feel there is work to be done in the district and I believe I can play a role in the decisions that will shape the future for the district. As board members in Delaware, we are a volunteer group of citizens who have taken on the responsibility of advocating for Public Education. Delaware’s board members are using their voices to shape the future for the children in Delaware and our communities. We do this by recognizing and celebrating the accomplishments of the students and staff by attending everything from open houses to graduations. Second, we work with parents and parents groups to build relationships that foster the “developmental assets” needed to help our students grow. We also work with other stakeholders and education groups, both state and federal, that can lend insight and help to see that all children have the right to a good education experience. Lastly, as board members we need to promote not only board service, but also long term service that research has shown is the best way to influence the education our children receive in both Milford and Delaware. What are the three important issues facing your district, and how do you plan to address them? A. New Superintendent search: Currently the district has contracted with University of Delaware DASL group to conduct the search. First step is Community meetings to get input from the Milford stakeholders as to what is needed in a new superintendent. After this a job description will be finalized with the board and sent out possibly on a national search network asking for resumes from candidates. Once the time frame for submission of resumes is complete they will be initially evaluated and graded by a rubric to screen for interviews. Once the candidates have been interviewed and evaluated the final decision is made by the board and a contract is offered. B. Shrinking financials from the State Budget: Currently the State budget is showing more cuts to Education dollars and the district struggles to keep salaries in the district competitive to keep good teachers in the district. Lobbying the legislators and meeting with our local representatives a key to making the point that education quality comes with a price tag. The RTTT grant has a limited lifetime and many initiatives started with this funding will not be sustainable when the dollars go away in 3 years. The districts free and reduced population continues to grow with ~56% currently and meeting the needs of this population involves more then teaching their children to pass a test. Finally, the district needs to continue to look at ways to save money through collaboration and shared services, and by not investing in services that only serve one group and not the whole student body. C. Communication with Community Stakeholders: In the last several years many decisions made surrounding the education of the children of Milford have been taken out of the hands of the community where it belongs, and made by members of the state, district and building staff. From Superintendent choice, to which test we are teaching our children too, and finally policies such as dress code these decisions need to have more input from the public and parents they directly affect. The board should meet with and look for better ways to serve the needs of the growing diverse groups in Milford, not just the small circle they are part of. The Milford Community continues to change and the School District must change with the changing needs of the children and parents in the community. 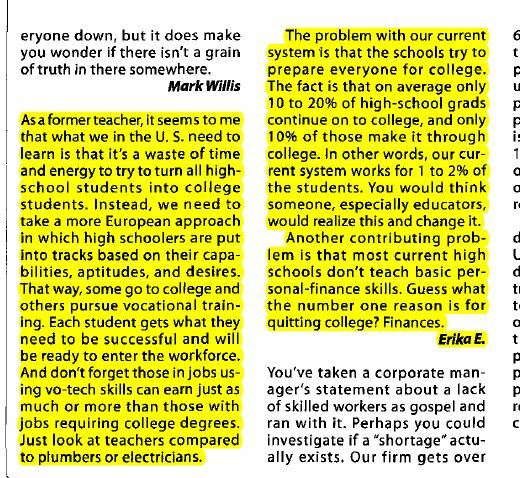 Below is a copy of an article I found in an engineering trade magazine that expresses what many including myself have been saying, but no one seems to be listening. What I found interesting this was coming from a former teacher, and I’m sure there are a few more like her that quietly are saying the same thing. Some interesting discussions coming out of the NSBA Conference this weekend. I particularly like the one statement that was learned, and I have said this many times after having talked to students. 1. Why are you running for School Board? I am running for the board because I still feel there is work to be done in the district and I believe I can play a role in the decisions that will shape the future for the district. As board members in Delaware, we are a volunteer group of citizens who have taken on the responsibility of advocating for Public Education. Delaware’s board members are using their voices to shape the future for the children in Delaware and our communities. We do this by recognizing and celebrating the accomplishments of the students and staff by attending everything from open houses to graduations. Second, we work with parents and parents groups to build relationships that foster the “developmental assets” needed to help our students grow. We also work with other stakeholders and education groups, both state and federal, that can lend insight and help to see that all children have the right to a good education experience. Lastly, as board members we need to promote not only board service, but also long term service that research has shown is the best way to influence the education our children receive in both Milford and Delaware. 2. What past experiences will you draw on to assist you on the Milford School Board if you are elected? As I mentioned previously, I have been involved with the Milford Board of Education for 10 years, and during that tenure I have served in several capacities. I represented the Milford School District for 8 years as the representative to the Delaware School Boards Association Board of Directors, and served as that organization President 2007/2008. During my term as DSBA President I represented all state boards at the National School Boards Association Convention which gave me more insight into how National issues influence our State Issues. During my 10 years with Milford I have also served on teams dealing with issues ranging from Superintendent Searches to passing successful referendum for new construction, district technology and infrastructure, and most recently the board’s representative to all training and meetings dealing with Milford’s RTTT plans. Pride myself as being one of the most transparent board members in the state with one of the first webpage’s in the state set up to allow open communication about education (www.viewsfromlowerdel.wordpress.com). I also continue to make myself available to all groups to discuss issues in the district, including the MEA, administrators, and parents. 3. What are specific issues that currently face the Milford School District? B. Shrinking financials from the State Budget: Currently the State budget is showing more cuts to Education dollars and the district struggles to keep salaries in the district competitive to keep good teachers in the district. Lobbying the legislators and meeting with our local representatives is a key to making the point that education quality comes with a price tag. The RTTT grant has a limited lifetime and many initiatives started with this funding will not be sustainable when the dollars go away in 3 years. The districts free and reduced population continues to grow with ~56% currently and meeting the needs of this population involves more then teaching their children to pass a test. Finally, the district needs to continue to look at ways to save money through collaboration and shared services, and by not investing in services that only serve one group and not the whole student body. C. Communication with Community Stakeholders: In the last several years many decisions made surrounding the education of the children of Milford have been taken out of the hands of the community where it belongs, and made by members of the state, district and building staff. From Superintendent Choice, to which test we are teaching our children too, and finally policies such as dress code. These decisions need to have more input from the public and parents they directly affect. The board should meet with and look for better ways to serve the needs of the growing diverse groups in Milford, not just the small circle they are part of. The Milford Community continues to change and the School District must change with the changing needs of the children and parents in the community. 4. What is the greatest success Milford School District has had in the last two years? The Milford School District has put together probably the best RTTT plan of any district in the state and this has resulted in additional funding coming into the district. This was all possible because of an exceptional team and a plan that was overseen by the outgoing superintendent. Other shining stars would be the completion of the two new schools in Milford both on time and on budget. Currently, Milford has one of the feature High School Campuses in Kent/Sussex counties. On the Education front, the graduation rate has improved, and the number of students involved in AP classes has risen as well. Finally, Milford High School came off the Academic Watch list last year for the first time in 5 years. 5. What do you hope to have accomplished by the end of your next term if you are elected? The number one priority would be the hiring of a new superintendent and the smooth transfer of power to that individual and their team. Following that I would like to see the state return the Education budget to the pre-2008 cuts level, and also see more flexibility for districts to leverage those funds to best serve the students in the district. I will continue to support statewide initiatives to make equalization funding better for all districts in the state so that smaller, poorer districts can still be competitive for salaries. Finally, I would like to see a better success rate for our Milford students being accepted in the colleges of their choice which can only happen if we prepare them for the “right” test, and with teachers given the chance to teach more then just to a test. 6. How will you assist the new Superintendent in his/her role in the District? The one employee the board is directly responsible for and has the right to expect will carry out the directions of the board and in-directly the community is the Superintendent. The superintendent should treat all board members equally, should keep them informed in a timely manner, and make sure the board has the best information to make the right decisions. Based on these expectations, I look forward to finding creative ways to insure we maintain the districts current infrastructure and still provide services best meeting the needs of our students. My contacts from my time on the board will assist me in pointing the new superintendent towards folks in the state legislature who can help the district navigate the new legislation on the horizon. Finally, because of the state of the State right now the next superintendent will need help understanding Funding, School Safety, and Recruiting/Retaining high quality teachers in the lean years ahead. 7. Why should people pull the lever for you on May 8? Education issues have been my passion throughout my time on the board to date, and I continue to want to expand my knowledge everyday so I can best help the students in Milford. My own children, as well as, my wife and I are graduates of Milford and so there is that pride in seeing the district succeed! Again, even when I’m not in the board room I am talking or doing something with Education and I travel the state making sure I have all the right information to make the right decisions based on facts and data! I am a “reachable” member of the community who can talk to everyone from students to Secretaries of Education about why getting the best Education is important for Milford.